Greetings all; Hope your training is going well. I would like to talk about stances and their pivotal role within our art. Stances primarily refer to the lower portion of the body, A strong stable base is needed to perform powerful, fast, accurate, and smoothly executed techniques. The upper part of the body is balanced on this firm base, and the stance enables us to develop and execute maximum power with each technique. Stances form the foundation of all movements and techniques as they maintain stability while at the same time allow quick and precise movement. When the body is stable, tension in legs and feet is transferred to the body’s centre of balance to furnish a firm foundation for any technique while still permitting rapid body movement in all directions and without a firm foundation, movements will be unstable and techniques will simply lack speed and power. Stability and movement are essential in the practice of Shim Jang Taekwondo so that each block or attack can be effective, therefore the body must be stable so maximum force may be transferred. While maintaining your stability, you must also be able to move quickly. It is also important to note that Hip rotation is also very important in allowing us to achieve maximum power in any technique. Beginning a technique with a correct stance will ensure that the hips are utilised to their maximum potential. So how do you perform a correct stance ? Forward Stance (or walking stance) - This is a strong stance for front and rear, both in attack and defence. 1. Move one foot to either front or rear at a distance of aprox one and a half to two shoulder widths between the big toes and a shoulder width from one centre of the instep to the other. 2. Bend the front leg slightly, extending the opposite leg fully. 3. Distribute the body weight evenly on both feet. 4. Keep the toes of the front foot pointing forward, the opposite foot 15 to 25 degrees outward. 5. Tense the muscles of the feet with the feeling of pulling them toward each other. 6. When the right leg is bent, the stance is called a right walking stance and vice-versa. 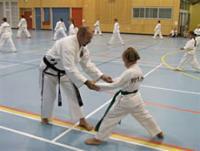 Back Stance - This stance is widely used for both defence and attack. The front foot is readily available for kicking with a slight shift of the body weight and with the advantage of half facing as well. 1. Move one foot to either front or rear to a distance of approximately one and a half times the shoulder width from the footsword of the rear foot to the toes of the front foot, forming almost a right angle. 2. It is recommended that the toes of the rear foot point about 15 degrees inward. 3. Bend the rear leg until the kneecap forms a vertical line with the toes, bending both the front and rear legs proportionally. 4. Keep the hip aligned with the inner knee joint. 5. The ratio of the body weight is about 70 percent on the rear leg and 30 percent on the front. Horse Riding Stance - This is a very stable stance for lateral movement. 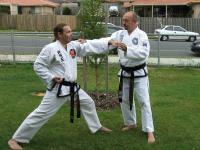 It is also widely used for punching and development exercises as it assists greatly in the development of hip movement. 1. Open the legs (usually by moving the left foot) to the side at approximately one and half a shoulder widths between the feet. 2. Point the toes to the front and distribute the body weight evenly on both legs. 3. Extend the knees outward, bending the knees (ie; sitting into the stance like sitting on a chair). 1. The body weight is distributed evenly on both legs. 2. The distance between the big toes is about one and a half shoulder widths. 3. When the right foot is advanced, the stance is called a right fixed stance and vice-versa. 4. The body is always half facing, both in attack and defence. Cat Stance - (or rear foot stance) This is used for defence and occasionally for attack. The advantage of this stance is the ability to kick or adjust the distance from an opponent with the front foot, which can move spontaneously without any additional shifting of the body weight to the rear foot. 1. Move one foot to the front with the heels almost touching. 2. Bend the rear leg until the knee comes over the toes, with the heels almost touching. 3. Bend the front leg, touching the ground with the ball of the foot raising the front heel slightly. 4. Distribute most of the body weight on the rear foot. 5. It is always half facing, both in attack and defence. 6. Keep the knee of the rear leg pointing slightly inward. While moving in any stance, the feet should always stay at least a shoulder width apart. This insures you always maintain balance.